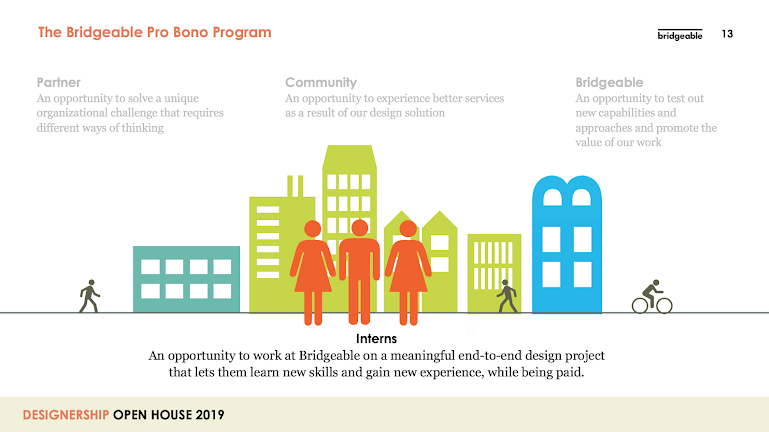 The Bridgeable Designership is a paid, full-time internship working on a social impact project. It gives us the opportunity to both teach and learn from bright minds in design, strategy, and research. Every year we host our Designership Open House to educate prospective applicants about Bridgeable and the Designership. We held this year’s Open House on Wednesday, January 9. Our office was packed! The 2018 Designership team gave a presentation about their project. 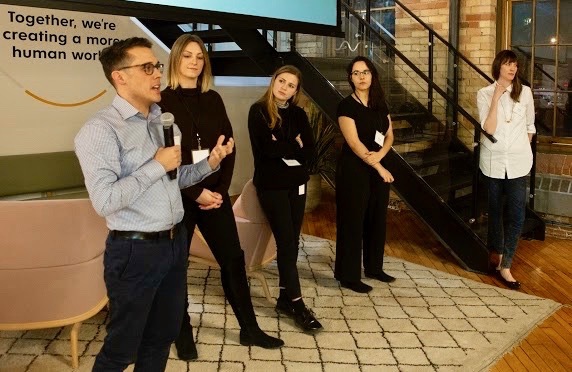 This was followed by insider tips for a knockout application, a Q & A session, and mingling with Bridgeable team members. 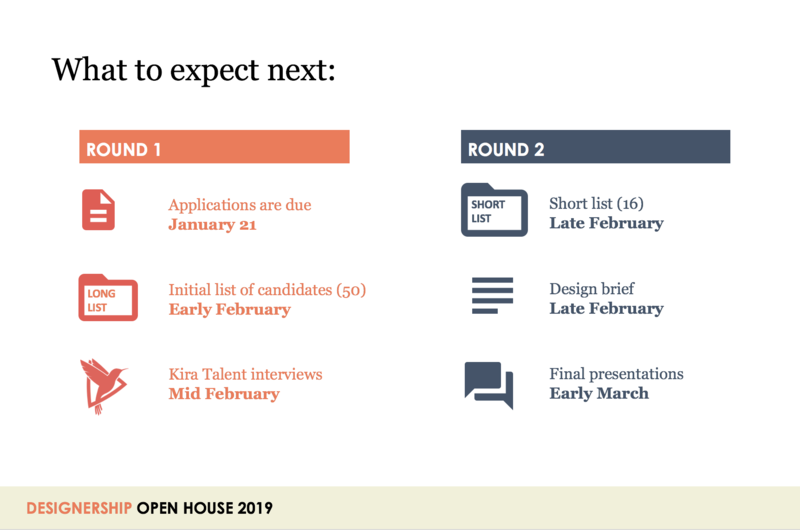 If you’re interested in applying for the Designership but weren’t able to attend the Open House, read on. Client: Participating in the Designership is an opportunity for a client to solve a unique organizational challenge that requires an innovative approach. Community: The Designership benefits the larger community by creating better, more human experiences. Bridgeable: The Designership is a chance for us to test new capabilities and approaches. It’s also a great opportunity to promote the value of our work to a wider audience. Interns: Designership interns receive hands-on training and get to work on a meaningful end-to-end design project with real social impact—learning new skills and gaining practical experience while being paid. Use the resources available to you to understand Bridgeable. This includes our website and Twitter feed. This should go without saying, but please follow the application instructions. Applications that do not include all the required elements will not be considered. Proofread. Proofread again. If you can, find an editor you trust . . . or at least spend some time away from the process and review your application with fresh eyes. A well-edited application will speak volumes about the polish and attention to detail you would bring to client work. Don’t send us a boilerplate letter! Write it just for us. To get our attention, think about what you can’t convey elsewhere. Use this space to share insights that may not neatly fit into the rest of your resume. Show your personality. Tell us why you’re passionate about human-centred design. 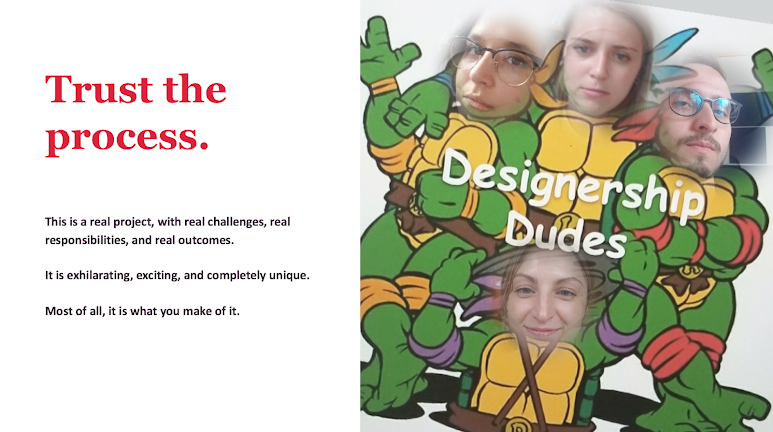 And let us know why you think you’d be a great fit for Bridgeable and the Designership. In your cover letter, specify which role you’re applying for. Demonstrate your confidence. Share your approach in one powerful, concise statement. And remember: short and coherent is better than long and disjointed. A mission statement is not required for the Project Journalist application. Describe your relevant experience and your applicable skills. Giving us insight into who you are as a person helps set you apart from the pack! Demonstrate your capabilities. Create good narratives, and be sure to include context. Show us your process. A picture is worth ten thousand words! Include a slide deck from a school project / client pitch. An overview of qualitative and/or quantitative study you have participated in. Think about including a story of a world adventure you’ve had. Include a lonely photo with no context. Include your entire thesis. (The abstract will do). Include a group project without explaining your role on the project. Submit all pieces as one PDF, and don’t forget that maximum file size is 10 MB. * Follow our defined naming convention. Submit by the stated deadline. *NOTICE: We’re experiencing a technical glitch relating to file sizes. While the maximum file size noted in the job postings is 10 MB, you will receive an error message if your application is over 6 MB, and it will not upload properly. In this situation, please try compressing the file before submitting. If you are still having trouble after compressing the file, please send your application directly to careers@bridgeable.com, noting the role you’re applying for in the email subject line. We apologize for any inconvenience this may cause. To apply for the Designership, visit bridgeable.com/designership.